As with all significant life-stage events, marking the occasion of your child’s christening or baptism with a cake is a popular tradition. Unlike birthday cakes, the naming day event has additional significance so christening cakes tend to be more like wedding cakes than party or birthday cakes. Customizable in a variety of flavors and decorations, christening cakes can range from the simple sheet cake to extravagant stacked tiers. Baptism, or christening, became a Christian right of passage following the baptism of Jesus Christ by John the Baptist in the River Jordan in the Middle East. It was said to represent purification and the washing away of sin, so that the individual was free to enter the kingdom of God and the practice was readily adopted by early Christians. Traditionally the celebration of the christening marks the day the child is formally accepted into the religious community. The occasion is often marked by the child receiving a Christian name and is attended by the child’s family members, friends and others who pledge to take a prominent role in the child’s spiritual development. The ceremony, which often takes place in a church and is conducted by an ordained member of the church, is then usually followed by a luncheon or dinner party hosted by the child’s parents and family. Gifts, that are also intended to guide or help the child in life, are given by attendees. One of the central elements to this celebration is the christening cake. Christening cakes can take a variety of sizes and shapes and are usually decorated with white icing accented with pastel colors. 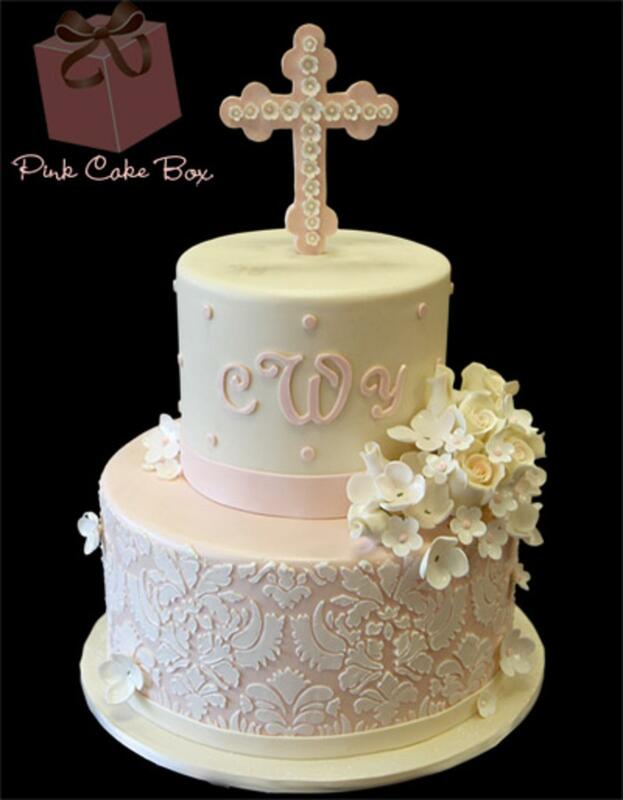 One simple, yet elegant, and very traditional shape for a christening cake is to mould the cake in the shape of a cross. To do this you can bake your cake in a regular sheet pan. Once cooled, the cake can be cut and formed into the shape of a cross and decorated with your favorite icing. Spread vanilla butter cream or royal icing in a thin layer over the entire surface area of the cake. Use food coloring to lightly tint some extra frosting and use a piping bag fitted with a star tip to pipe a decorative border. For larger parties, you may consider making a multi-tier christening cake. Tier cakes can be made wit either round or rectangle cakes or a combination of both. Bake your cakes, allow them to cool and cover with icing. Arrange the cakes in size order starting with the largest on the bottom to the smallest on top. If necessary, you can insert wooden dowels for support. This is a good idea if you are using a heavy cake such as fruit or mud cake to form your tiers. Once the tiers are secured in place, decorate the christening cake layers with colored icing, candies, flowers or fresh fruit. A ribbon around the base of each layer helps to tidy up any messy joins. Use pins to secure the ribbon but be sure to remove them before serving. Modern christening cakes can take nearly any shape or form; they no longer need to be presented in the shape of a cross. Visit your local craft store to see what kinds of moulds or baking pans are available. Another nice idea is to make a cupcake christening cake, formed of individual cupcakes that are stacked on tiers or stands to resemble the traditional tiered cake. Cupcakes can be made with traditional cake batter divided into individual paper lined baking cups. Once cooled, these mini cakes can be decorated with traditional butter cream and sprinkles. For more experienced cake bakers, you can create a tiered cake covered in fondant. Ready to use fondant is widely available in baking supply stores and can be molded into various shapes or colored with food coloring but can be difficult to work with, so inexperienced bakers and decorators might need to practice a bit. Fondant can be cut into whimsical shapes such as hearts, crosses, polka dots and more.